My trip to the vein center yesterday went well. The procedure lasted about one hour and was relatively painless... just 15 to 20 brief pinches when the doctor was inserting pain meds or making holes to remove veins. I could not view the procedure because of the location of my head relative to my leg, but it is just as well because I might have anticipated the pinches. Near the end of the procedure, I asked the doctor what a vein looked like because I had never seen one in the flesh, so he showed me a vein he had just removed from my leg and it looked like hollow spaghetti with some red sauce. I go back tomorrow for an ultrasound to make sure everything is copacetic. Rodney To (in pink) femulating in a 2012 episode of television's Modern Family. I am glad that everything went well. There is an Asian woman doctor who golfs where I golf. She is a very good golfer and has been the ladies champ in the past. She is also a vein specialist and never hesitates when she sees any club member in shorts showing the need for treatment. So far she has eyeballed my fine hairless legs but has not found a need to make me a client. In fact she complimented my legs. 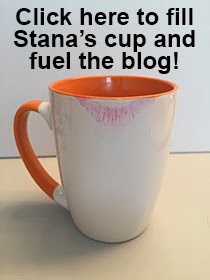 Great news, Stana, and hope everything is "copacetic" with your follow-up. But can you identify the dress in today's "Femulate Her" photo? It is gorgeous!! It is gorgeous, but sorry, I don't have a clue about its origin. I found it on Pinterest without any identity.